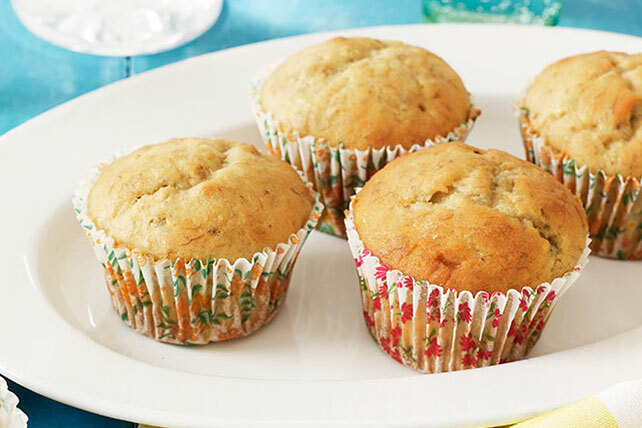 Our Banana Muffins with Sour Cream impress with nutty notes of chopped walnuts. Turn out a fresh, moist batch of banana muffins today with our recipe. Combine first 4 ingredients. Beat butter and sugar in large bowl with mixer until blended. Add bananas, sour cream and eggs; mix well. Add flour mixture; mix just until moistened. Stir in nuts. Spoon into 16 paper-lined muffin cups. Bake 22 to 24 min. or until toothpick inserted in centers comes out clean. Cool in pans 5 min. Remove to wire racks; cool slightly or to room temperature. Bake and cool muffins as directed. Cook 2 oz. BAKER'S Semi-Sweet Chocolate and 3 Tbsp. whipping cream in small saucepan on low heat until chocolate is completely melted and mixture is well blended, stirring frequently. Cool 3 min. or until slightly thickened. Drizzle over muffins. Let stand until glaze is firm. Add one of the following to batter before pouring into prepared muffin cups and baking as directed: 1 pkg. (4 oz.) chopped BAKER'S Semi-Sweet Chocolate, 8 slices cooked and crumbled OSCAR MAYER Bacon, 1 cup KRAFT Caramel Bits, or 1 cup toasted BAKER'S ANGEL FLAKE Coconut.